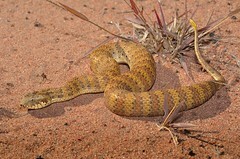 A bite from a Death Adder can be almost painless. You may be bitten and envenominated without knowing it. 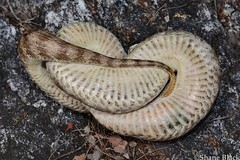 This snake will not try to escape, but stay where it is and try to hide. If you come too close or even step on it, you will be bitten. 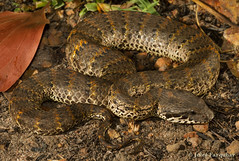 Members of this genus are short, squat terrestrial snakes. These snakes are true ambush hunters. 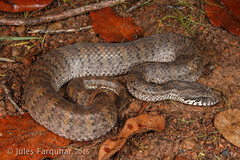 Look up complete taxonomic records of Acanthophis hawkei (including synonyms) at THE REPTILE DATABASE (by Peter Uetz et al).